Last week I found my way to one of my favorite cities in Virginia, Richmond. The drive can be under 2 hours depending on traffic and is a perfect little getaway from everything DC. One of my favorite aspects of the city is how you can walk almost anywhere. 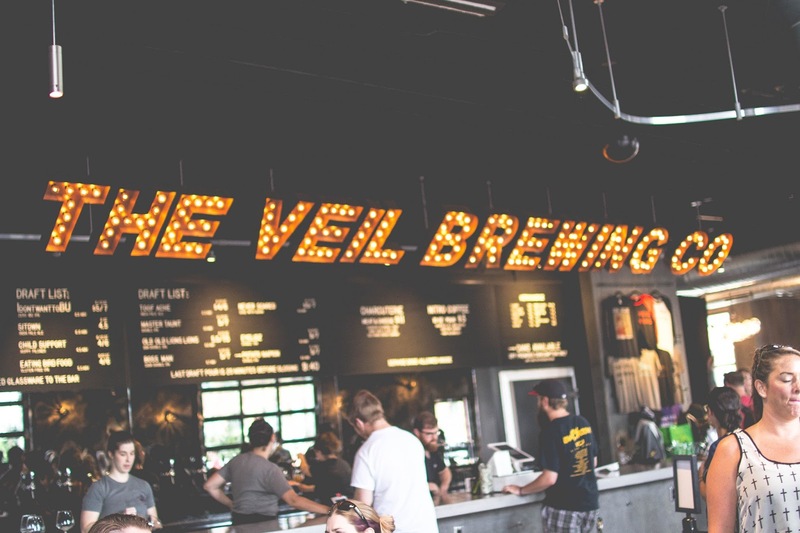 After going to a local farmer's market in the morning we headed to a newer brewery, The Veil. It was a little warmer out so we decided to sit inside versus their outdoor seating to chat and reminisce about our college days. From The Veil, we walked to another brewery a few blocks away. Along the way, I bullied a friend into taking these photos for me. On a hot summer day, there is nothing better than an easy summer dress. This dress, last worn here, was one I scored on sale last year from Urban Outfitters. I love the faux wrap style so I never have to worry about it actually coming undone and it accentuating my waist. It is the perfect little black dress for hot summer days and I wish I had it in multiple colors. After the second brewery and a little summer storm, we went to a Mexican restaurant, En Su Boca, for more drinks and dinner. One thing I love about this place is that you can add fruit and champagne to any drink for $2. SOLD! I hadn't been to Richmond since December so I love reconnecting with my favorite little town. I'll be heading back to my favorite little city once a month for the next few months so I will be sure to share my adventures with you all.